The 40 year mark. It's when a designer gets their day. And for Elie Tahari, September 4 was officially proclaimed Elie Tahari Day by Mayor Michael Bloomberg in New York. Celebrating the honor at his Fifth Avenue pop-up shop, the Fort Hamilton Marching Band herald in the ceremony and the industry's best including the heads of Saks Fifth Avenue, Bergdorf Goodman, the CFDA and "Project Runway" came to show their support. Joan Rivers gave heartfelt welcoming remarks with quips of humor like how she was one of the first women to wear his tube top, a style that he created, but now it lives as a skirt and hangs on her legs. During his speech, he told the audience how he came to New York with $100 and a dream and discussed the hard moments like living in a shelter for runaway boys. He also thanked the industry and fans and told those in attendance that the one thing they could is "make someone happy today." As part of his day, he donated $35,000 to Save The Garment Center. This money came from profits that were made from a dress created by Anthony Ryan Auld as part of a design challenge from season 2 of "Project Runway All Stars" and sold at Tahari's boutiques. The money will be used to help provide support and awareness for manufactures, emerging designers and to help fuel the made in America movement. 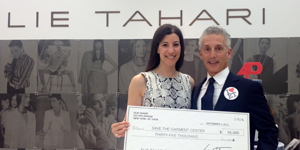 The Save the Garment Center's website details, "Tahari’s $35,000 donation is the largest contribution that STGC has received to date and will help revitalize the organization’s ability to preserve, promote, and save New York City as the world’s fashion capital." Learn more about the organization at Save The Garment Center.